The exterior of "Our H2Ouse," the housing design submitted by the UC Davis 2017 Solar Decathlon team. Construction begins in January in preparation for national competition in October. A team of UC Davis students are tackling the California drought through innovative housing design with their entry for the U.S. Department of Energy’s 2017 Solar Decathlon. The design focuses on cutting typical residential water use in half while maintaining the same level of comfort at an affordable price. Held every two years, the Solar Decathlon challenges collegiate teams to design, build, and operate solar-powered houses that are cost-effective, energy-efficient, and attractive. National teams will compete in Denver, Colorado in October 2017. The winning team best blends affordability, consumer appeal, and design excellence with optimal energy production and maximum efficiency. Design plans are due to the competition this month, with construction scheduled to begin in January on a field beside the UC Davis West Village community. California is experiencing one of the most severe droughts in the state's recorded history, now in its fifth consecutive year. In many cases, water usage has been restricted for home and agricultural use. With its Our H₂Ouse (“our house”) design, the UC Davis team seeks to create a home that will change water consumption for the better in the face of ongoing and future water demands. 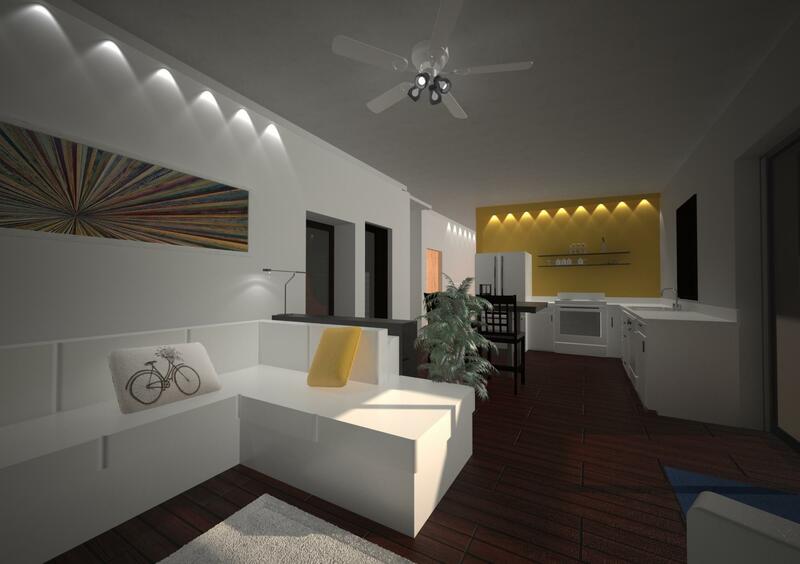 Rendering of the interior of Our H2Ouse, a drought-minded housing design prepared for the UC Davis 2017 Solar Decathlon team. The home design's features include systems for rainwater catchment, graywater and blackwater re-use, and a two-way communication system to monitor water and energy consumption. At the 2015 Solar Decathlon at Irvine, California, UC Davis’ Team Aggie Sol took home a first place win for affordability and commuting with its zero net energy house designed for farmworkers. Preparing for the Solar Decathlon is a campuswide, multidisciplinary effort involving team members from many academic backgrounds, including design, engineering, communications and economics. The team is assisted along the way by UC Davis faculty and staff. Engineering professor Frank Loge, director of the UC Davis Center for Water-Energy Efficiency, serves the team again as faculty adviser, a role he held for the 2015 competition. Kat Kerlin, UC Davis News and Media Relations, 530-752-7704, kekerlin@ucdavis.edu, For images of the home's design, contact Kat Kerlin, kekerlin@ucdavis.edu.